Arizona Gov. 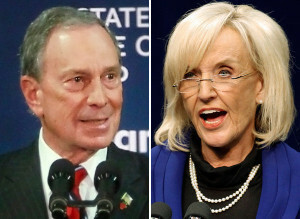 Jan Brewer (R) hit back at New York City Mayor Michael Bloomberg this week, suggesting that his undercover sting to expose lax Arizona firearms laws was an indication that he thought he’d already taken care of business at home. The governor went on to explain that Arizona was a “big Second Amendment state,” and that she supported the current version of its firearms laws, a line similar to one she took in the immediate aftermath of the video’s release earlier this week. Brewer then seemed to argue that both individual patrons, as well as merchants, should be working in conjunction to ensure that firearms laws were enforced. “Those people that buy guns from private owners at a gun show have the responsibility, if they knowingly realize it, someone cannot pass a background check or if they suspect that maybe they are mentally incompetent, it is a state felony and a federal felony,” she said.